I cut my own hair a few days ago (see photo above) and used a conditioner that has a silicone in it! Let me explain :). I wasn’t in the mood to search for a natural hair salon in the DMV area and I didn’t feel like paying $100 for a simple hair cut, so I cut my own hair. I used quality professional hair cutting shears, I don’t recommend using any other types of scissors. I have cut my hair many times before, so I was pretty comfortable. I just wanted some layers in the front, nothing major. I feel like shorter hair in the front frames my face better than just one long length. My hair was also looking dry and it was super tangled from wearing it out so I wanted to use a conditioner that had a silicone in it for extra shine, and I heard Aussie Moist had amazing slip. Aussie Moist Conditioner delivered on both!!! I detangled my hair in under 10 minutes and my hair was left soft and shiny. The reason I chose to use Aussie Moist is because it contains a modified silicone bis-aminopropyl dimethicone. This silicone is water soluble and is easily washed off, so you don’t have to worry about blocking moisture to hair or build up. I will be adding Aussie Moist Conditioner to my arsenal, to use when I’ve been wearing my hair out for days and it needs a good quick detangling with added shine :). Have you tried Aussie Moist Conditioner? I love Aussie Moist. I have no idea why I stopped using it. It has wonderful slip. Your haircut looks nice! Thank you Tiffany! Yes, you need to revisit Aussie Moist! Now that is a great haircut. 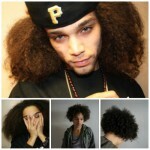 Curly hair is versatile, you prove that here. Thank you so much Snowden :). 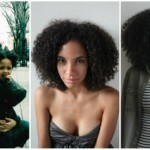 Natural hair is very versatile. You can check out Salon Essence on U St or Florida Ave between 10th and 11th st. When you go ask for Demetrius, he is the owner. Thank you so much for the info Natalia. I’m not sure I will still be living in the DMV by the time I need another cut…lol. We are trying to move asap! Where are you guys headed? Will pray that move comes sooner rather then later!!! Much love!!! We are flying to Austin, Texas this Thursday to check it out and see if we want to buy a house there. I had done a lot of research about different cities around the U.S. before I moved to the DMV and Austin seemed like the best fit for our life style. We will see! Thank you so much for your prayer Natalia, we need it! Wow…would you look at that! And I don’t believe in coincidence ;). They sound like they would be more than familiar with Austin! What’s the name of the club? Do you like Austin? Thank you so much for your help Natalia! It is called the basement and they would help any friend of mine. My daughter is also there in the summers with them so they are also familiar with camps etc. She will be there in August. I love Austin depending on the area.. email me at mixitalian1778@gmail.com. Can give you some info if you have any questions. Hey don’t call it a coincidence call it things happen for a reason. Austin is a fantastic town/city. I went to college in the hill country (you will become familiar with that term should you move there) and lived in Austin after college. My best buds from college are still there (I’m in Houston). It is a fantastic city for outdoor activities – plenty of lakes, trails for biking, hiking, well-known music scene – just lots of opportunities to enjoy. I absolutely love it’s flagship Whole Foods as well (albeit I go to WF in Houston too). Good luck! I’d given up on conditioners for my locs bc they usually coat them but this one may work since the cone is water soluble. I may just give this one a try. I usually mix aloe and honey and that works well but I’d love to have a conditioner that really leaves more moisture. About moving – like minds sis :). I often read your blog wo commenting but I remember you saying in a post how you noticed that you were less distracted once you left nyc and I found the same thing to be true. LOVED my 5 yrs on the east coast (lived in both nyc and dmv area & yes found that I was alot less distracted in the dmv area) but now live in TX yaaay (if you guys move here – it’s been 3 yrs and I have NO regrets – I’m in the Dallas area though as I found it to be a better fit for me over Austin. Like you, I checked out all metro areas though – Austin, Dallas & Houston & carefully assessed). Anyway, I’d LOVE to link up if you are ever interested, Austin is just 3.5 hrs away from me. You are on the right track in regards to your thinking. I’m even less distracted here (and the metro area offers me plenty) and essentially have turned my whole life around. God is now my center, I’ve always been small like you but now I’m actuallly getting fit, 8 hrs of sleep lol, always been a healthy eater but took that up a notch. It’s just all around more balance and I’m soo much happier. I’m a writer and will be starting my first collection of short stories soon. You so won’t regret TX. It’s just enough without being too much. I live about 20 minutes outside of Dallas and when I want to see a play or visit a showing at the museum, it’s a short drive. Good luck and feel free to reach out if you have any questions! does he do trims or does someone else do them? how much are the trims? Yes he does. I have been going to him for over 10+ years. It is DC remember that but his work is well worth it. Since I have been leaving the conditioner in my hair I flew to Aussi Moist because of the amazing things I heard about it. Unfortunately, it did not work as a combing conditioner for me. I thought it made my hair feel ashy and tough. I had to rinse it out. I think it works better for me as a co-washing conditioner. I will continue to use Vo5 and Hello Hydration. I love your hair cut too! I like the shape! Ahh…darn, I’m sorry it didn’t work out for you. It’s great for co-washing because you don’t have to worry about build up, so that’s a great thing! Hello Hydration was an old staple of mine, I still use it on my son’s hair sometimes :). i’ve been hearing quite a lot of good things about aussie moist, lately. i’ve never tried it even though it’s inexpensive and pretty easy to find. *shrugs* the new cut is gorgeous, too! Thank you so much Monniej, you should try it! I first tried it on my son’s hair and I loved how fast it detangled his hair! I bought the big family size bottle from Target for like $5!!! Lindaaaa = gorgeous in Portuguese!!! Aussie Moist used to be my go to conditioner. I still love it but I have discovered Aussie Smooth Down and Aussomely Clean and they are even better. I love these conditioners. They make detangling a breeze and I have no problem with build up etc. I also buy the family size! Thank you for sharing T! I will have to try those other Aussie conditioners as well!!! can you recommend what shears you used??? i bought a pair on amazon and cut mine yesterday but i’m wondering if they were too cheap (on sale at around £11 down from £30) and am scared i will do more damage than not? or is that just a silly concern? HELP! It’s not a silly concern. I used shears by Conair, I either bought them at Target or Walgreens in the hair care section:). I know Conair specializes in hair products so you can guarantee they aren’t just a pair of regular scissors. Witch one of Conairs shears did you use? I googled it, and there´s many different ones to choose between..
Also, are you and Cipriana not going to make any more youtube-videos? Hey Emma, I’m not sure which Conair shears I bought because it doesn’t say on the actual scissor, it just says Conair and it has a black handle. Sorry I couldn’t be of more help. But any shears by Conair should be fine :). Beautiful as always!! You did a good job! Thank you for sharing K!!! I’m no expert regarding haircuts, but you have done a lovely job and it has framed your profile making you look younger. :)) I used Aussie Moist Conditioner as my final rinse to add shine. Thank you so much Deborah! I think it does make me look more youthful! I guess that’s why women cut their hair shorter as they get older. Can you explain how you trimmed your own hair? Thanks in advance! Hey Leslie, I apologize for the late reply. Its hard for me to explain in writing how I cut it. It would be better to show you in a video, but I’m not sure when I will have time to shoot one. But I can tell you there are some wonderful youtube videos about cutting layers on natural hair and cutting layers to frame your face in general. I looked at those videos, combed out all my curls, sectioned the front of my hair, stretched the sectioned parts and cut going down on a slant like I saw in some of the videos I watched :). I hope this helps. This is off topic but that septum is it faux or real? I want a faux one to wear but I really love yours. 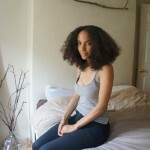 I haven’t tried the conditioner but finding a stylist in the DC area willing to take on my texture is really hard and I still haven’t found anybody yet. It’s a real septum, I got it done September of 2011. You should try the conditioner for sure. I pray you find a stylist you love and trust! thanks I’ll need it. I think i’ll stick to my method of twisting my hair and trimming the ends. Once i take this protective style out I’ll give it a go again. I really want a septum but I don’t think my office would like it. plus I want to see how i like it first. I love the new cut, and I agree; it does frame your face nicely. And I see you tried on of my fav conditioners. I freakin love Aussie Moist condish I use it as a leave in. Thank you kindly naj. I freakin love Aussie Moist too! beautiful cut! i have to revisit aussie moist! it’s been forever since i used it! don’t know how long you plan on staying in the DMV but I would love to meet you before you go! Ironically, I’ve also been looking to relocate and Austin is one of the places that I’ve been looking at too! Hey Keisha, can you email me your info, my email is nikisha@urbanbushbabes.com. I know I tried some of the Aussie stuff when I was newbie naturalist-a,(former product junkie*ssh!) but I’ll give this a try soon. Hair cut looks good and healthy. Aint nothing wrong with getting scissor happy from time to time. But not TOO happy! Thank you Crystal…lol, I will try not to get too crazy with the cutting. You have yo try Aussie Moist again! I absolutely loved this post and I love your hair even more. I really wish you were in Dallas so that I could get mine cut as well. Lol I started the big transition over a year ago and right now I’m wearing a swing bob until the rest of the perm grows off and this is helping me to learn good products to use. Every since you told me about this being you and your best friends blog I’ve been reading it daily and it’s so refreshing. I’ve kind of adopted you as a mentor and I wanted to run some ideas of how to get some things started in my life. I would love to hear your opinion. Do you have an email? Nikisha, I love this pic of you, girl! You look hot (this is coming from a straight lady). As for the Aussie Moist conditioner, I have tried it in the past and loved it. I haven’t used it in months, though. I’m trying to use up the stuff I already have under my bathroom sink. I’m not afraid of silicones. My hair responds well to them. Thank you so much for the awesome compliment Foxyrou!!!! And thank you for sharing your experience with Aussie. Ain’t nothing wrong with using up the stuff you already have at home! I can relate to that! Hey nikisha! Im seventeen and i relaxed my hair one time and got sick of it! I transitioned for two years and just cut my relaxed ends this june so happy to be back to natural and so happy to know I can use this cheap product on my teenage budget lol i usually try to use organic products but im glad to know i will not have the bad build up! Thanks for the tip!! Will be trying this on vacation!! Hi Milan!!!! Thank you for sharing and your welcome! I hope you have a great experience with Aussie Moist, because it will be great on your pockets! Your hair looks amazing. 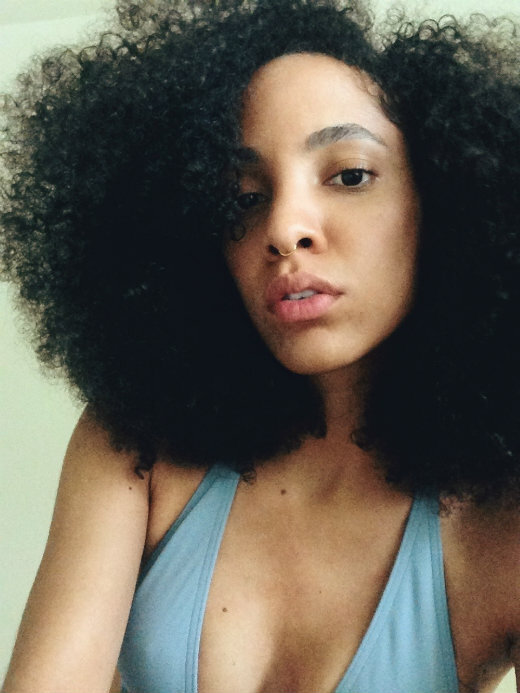 I use the Aussie Moist conditioner and deep conditioner on my hair through my transition and natural journey and I still use them to this day. Amazing products. Thank you so much for your kind words Jenelle and thank you for sharing your experience with Aussie :). Thank you so much for sharing Ursula. I will look into the three minute miracle :). Your hair looks amazing! I’ve heard that the cone in Aussie Moist isn’t water soluble though, it actually did build up on my hair at one point but I use shampoo anyways so it’s no big deal. Thank you so much KC. 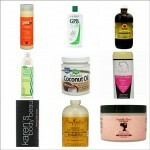 I got my info from JC of natural haven who studies the science of products as well as natural hair. I’m hoping she is right, but I will do some more research, thank you for sharing :). Thank you so much hhazy for the sweet sweet compliment. But I’m already married :). I love Aussie Moist! I use it after I shampoo and condition. I apply a generous amount, detangle with a Denman brush, et voila! Don’t even rinse it out. My friends started doing that too now and have stopped paying high prices for products that do the same job. Yes I love it! This is what I use when I wash my hair. It makes my hair so soft and easy detangling. Nikisha you have beautiful hair. Can you please do a tutorial on how you cut your hair? I have! Aussie Moist is my staple for detangling my APL hair! I love it!